@ UbiComp 2018 on October 9, 2018, Singapore. @ DFKI on September 24, 2018, Saarbrucken,Germany. Our eSense Open Earable Platform is ready for sharing, Apply here. I am hiring Interns for 2019, apply today. Details here. I am hiring multiple research scientists at my Cambridge Lab! Come and work with us. Details here. I am co-editing a special issue on Transformative Computing and Communication for IEEE Computer, please send your latest work here. Wondering what is happening at the IoT Space, look at The Daily Internet of Things. I lead the Pervasive Systems research at Bell Laboratories and hold a Design United Professorship at TU Delft. My team at Cambridge and Antwerp aims at building efficient, robust and personalised sensory systems with novel computational forms for disruptive mobile, wearable and IoT services in three application areas: Smart Home, Smart Enterprise, and Quantified Lifestyle. Personally, my research agenda is centred on Computational Behaviour Modelling. I am interested in system and algorithmic challenges in building multi-sensory computational systems to understand real-world human behaviour through modelling people-to-people, people-to-place, people-to-thing interactions. I borrow tenets from Social Psychology, learn from Behavioural Economics and apply Computer Science methods to drive my research. At heart, I am an experimental computer scientist, and I aim at building end-to-end systems with real world deployment. Some of the keywords of my research include: Internet of Things, Behaviour and Activity Modelling, Physical Analytics, Distributed Middleware, and Smart Objects. IEEE Computer SI on "Internet of Things"
Industry Talk, "Earables For Personal-Scale Behaviour Analytics", UbiComp 2018, Singapore, October 2018. Invited Talk, "Earables For Personal-Scale Behaviour Analytics", DFKI, Saarbrucken, September 2018. Featured Talk, "Earables For Personal-Scale Behaviour Analytics", MobiUK 2018, Cambridge, September 2018. Keynote, "Computational Behaviour Modelling for the Internet of Thing", IEEE RTCSA 2018, Hakodate, August 2018. Keynote, "Computational Behaviour Modelling for the Internet of Thing", Intelligent Environment 2018, Rome, June 2018. 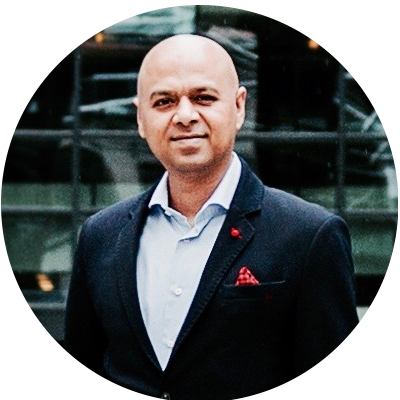 Featured Talk, "Wearables, AI and You", And& Summit, Leuven, Belgium, May, 2018. Keynote, "Wearables, AI and You", Code Europe, Warsaw, Poland, April, 2018. Keynote, "Computational Behaviour Modelling for the Internet of Things", ACM BuildSys 2017, Delft, Netherlands, Nov 2017. Keynote, "Computational Behaviour Modelling for the Internet of Things", TopConf 2017, Dusseldorf, Germany, Oct 2017. Keynote, "Computational Behaviour Modelling for the Internet of Things", IEEE MDM, Daejeon, South Korea, May 2017. Keynote, "Computational Behaviour Modelling for the Internet of Things", ACM MOBILESoft, Buenos Aires, Argentina, May 2017. Keynote, "Computational Behaviour Modelling for the Internet of Things", Code Europe, Warsaw, Poland, Dec 2016. Keynote, "Computational Behaviour Modelling for the Internet of Things", Code Europe, Krakow, Poland, Dec 2016. Invited Talk, "Computational Behaviour Modelling for Connected Living", TU Delft, September 2016. Featured Talk, "IoT 3.0 : Connected Living in an Everything Digital World", Moscow Urban Forum, Moscow, Russia, July 2016. Invited Talk, "Physical Analytics with Sensorless Sensing", Big Data Workshop, Shanghai, China, July 2016. Featured Talk, " IoT 3.0 : Connected Living in an Everything Digital World", TM Forum Live 2016, Nice, France, May 2016. Keynote, "The Story of Happy Brussels", Brussels Smart City 2016, Brussels, Belgium, May 2016. Invited Talk, "Physical Analytics with Sensorless Sensing", Waseda University, Tokyo, Japan, May 2016. Invited Talk, "Network Driven Behaviour Modelling for a Connected World", KU Leuven, Leuven, Belgium, April 2016. Keynote, "Network Driven Behaviour Modelling for a Connected World", TopConf 2015, Tallinn, Estonia, November 2015. Keynote, "Network Driven Behaviour Modelling for Designing User Centred IoT Services", Celtic Plus Day 2015, Antwerp, Belgium, October 2015. Keynote, "Network Driven Behaviour Modelling for Designing User Centred IoT Services", S-Cube Conference 2015, Rome, Italy, October 2015. Keynote, "Network Driven Behaviour Modelling for Designing User Cantered IoT Services", SAI 2015, London, UK, July 2015. Keynote, "Quantified Enterprise: Redefining Future Workplace Experience", MobiQuitous 2015, Coimbra, Portugal, July 2015. Featured Talk, "Network Driven Behaviour Modelling for Designing User Cantered IoT Services", M2M Forum, Milan Disruptive Week, May 2015. Invited Talk, "Physical Analytics with Sensorless Sensing", Hasselt University, Hasselt, Belgium, April 2015. Invited Talk, "Physical Analytics with Sensorless Sensing", MediaLab, Amsterdam, Netherlands, April 2015. Keynote, "Network Driven Behaviour Modelling for a Sustainable Connected World", IoT 360, Rome, Italy October 2014. Invited Talk, "Network Driven Behaviour Modelling for a Sustainable Connected World", University of Trento and CreateNet, Trento, Italy. September 2014. Invited Talk, "Physical Analytics with Sensorless Sensing", Umm-Al-Qura University. Makkah, Saudi Arabia, July 2014. Keynote, "Network Driven Behaviour Modelling for a Sustainable Connected World", GreenTouch Workshop, Brussels, Belgium, June 2014. Featured Talk, "Behaviour Modelling with Opportunistic Analytics", ICTF 2014, Poznan, Poland, May 2014. Keynote, "Behaviour Modelling with Opportunistic Analytics", DSP Valley Industry Summit, 2013, Machelen, Belgium, December 2013. Keynote, "Designing Interaction for the Internet of Things", Leuven HCI Seminar Leuven, Belgium, December 2013. Akhil Mathur, Anton Isopoussu, Fahim Kawsar, Nadia Berthouze, and Robert Smith, Nicholas D. Lane"Mic2Mic: Using Cycle-Consistent Generative Adversarial Networks to Overcome Microphone Variability in Speech Systems", The 18th International Conference on Information Processing in Sensor Networks (IPSN '19), April 16-18, 2019 Montreal, Canada. Seungchul Lee, Chulhong Min, Alessandro Montanari, Akhil Mathur, Youngjae Chang, Junehwa Song and Fahim Kawsar,. "Automatic Smile and Frown Recognition with Kinetic Earables", The 10th Augmented Human International Conference (AH 2019), March, 2019, Reims Champagne-Ardenne, France. Jacky Bourgeois, Gerd Kortuem and Fahim Kawsar. "Trusted and GDPR-Compliant Research with the Internet of Things", The 8th International Conference on the Internet of Things (IoT 2018), October 2018, Santa Barbara, California, USA. Mohammed Alloulah, Anton Isopoussu and Fahim Kawsar, . "On Indoor Human Sensing Using Commodity Radar", In CPD 2018 Workshop @ The 2018 ACM International Joint Conference on Pervasive and Ubiquitous Computing (UbiComp 2018), October 2018, Singapore. Sourav Bhattacharya, Alberto Gil C. P. Ramos, Fahim Kawsar,Nicholas D. Lane, Lynn M. Gionta, Joanne Manidis, Greg Silvesti, Mathieu Vegreville, . "Monitoring Daily Activities of Multiple Sclerosis Patients with Connected Health Devices", In UBIACTIVITY 2018 Workshop @ The 2018 ACM International Joint Conference on Pervasive and Ubiquitous Computing (UbiComp 2018), October 2018, Singapore. Akhil Mathur, Anton Isopoussu, Fahim Kawsar, Robert Smith, Nicholas D. Lane and Nadia Berthouze, "On Robustness of Cloud Speech APIs: An Early Characterization", In HASCA 2018 Workshop @ The 2018 ACM International Joint Conference on Pervasive and Ubiquitous Computing (UbiComp 2018), October 2018, Singapore. Chulhong Min, Alessandro Montanari, Akhil Mathur, Seungchul Lee and Fahim Kawsar, . "Cross-Modal Approach for Conversational Well-being Monitoring with Multi-Sensory Earables", In Computing for WellBeing Workshop @ The 2018 ACM International Joint Conference on Pervasive and Ubiquitous Computing (UbiComp 2018), October 2018, Singapore. Valentin Radu, Catherine Tong, Sourav Bhattacharya, Nicholas D Lane, Cecilia Mascolo, Mahesh K Marina, Fahim Kawsar. "Multimodal Deep Learning for Activity and Context Recognition", Proceedings of the ACM on Interactive, Mobile, Wearable and Ubiquitous Technologies (IMWUT), Volume 1, Issue 4 and The 2018 ACM International Joint Conference on Pervasive and Ubiquitous Computing (UbiComp 2018), October 2018, Singapore. Chulhong Min, Akhil Mathur and Fahim Kawsar . "Exploring Audio and Kinetic Sensing on Earable Devices", In WearSys 2018 Workshop @ The 16th ACM Conference on Mobile Systems, Applications, and Services (MobiSys 2018), June 2018 , Munich, Germany. Akhil Mathur, Tianlin Zhang, Sourav Bhattacharya, Petar V., Leonid Joffe, Nic Lane, Fahim Kawsar, Pietro Lio. "A Deep Data Augmentation Training Method to Address Software and Hardware Heterogeneities in Wearable and Smartphone Sensing Devices", The 17th International Conference on Information Processing in Sensor Networks (IPSN '18), April 11-13, 2018 Porto, Portugal. Akhil Mathur, Nicholas D. Lane, Sourav Bhattacharya, Aidan Boran, Claudio Forlivesi, and Fahim Kawsar, . "DeepEye: Resource Efficient Local Execution of Multiple Deep Vision Models using Wearable Commodity Hardware", The 15th ACM Conference on Mobile Systems, Applications, and Services (MobiSys 2017), June 2017, USA. Nicholas D. Lane, Sourav Bhattacharya, Petko Georgiev, Claudio Forlivesi, Lei Jiao, Lorena Qendro and Fahim Kawsar. "DeepX: A Software Accelerator for Low-Power Deep Learning Inference on Mobile Devices", The 15th International Conference on Information Processing in Sensor Networks (IPSN '16), 12- 14, April 2016 , Vienna, Austria. Biyi Fang, Nicholas D. Lane, Mi Zhang and Fahim Kawsar. "HeadScan: A Wearable System for Radio-based Sensing of Head and Mouth-related Activities ", The 15th International Conference on Information Processing in Sensor Networks (IPSN '16), 12- 14, April 2016 , Vienna, Austria. Geert Vanderhulst, Afra Mashhadi, Mina Dashti, and Fahim Kawsar "Detecting Human Encounters from WiFi Radio Signals", 14th International conference on Mobile and Ubiquitous Multimedia (MUM 2015), Nov 2015, Linz, Austria. Nicholas D. Lane and Sourav Bhattacharya, Petko Georgiev, Claudio Forlivesi and Fahim Kawsar "Understanding the Resource Bottlenecks of Deep Learning on Wearables, Smartphones and IoT Devices", In IoT-App Workshop @ The 13th ACM Conference on Embedded Networked Sensor Systems (SenSys 2015), Nov 2015, Seoul, Korea. 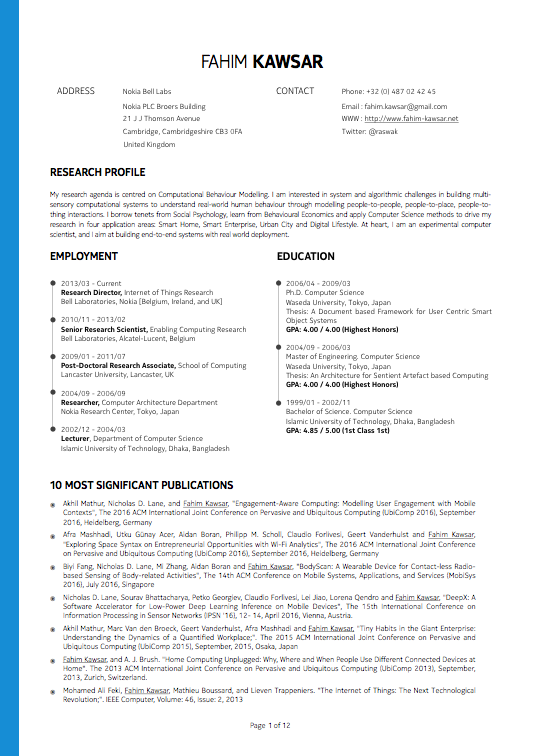 Utku Acer, Aidan Boran, Claudio Forlivesi, Werner Liekens, Fernando Perez-cruz, and Fahim Kawsar "Sensing WiFi Network for Personal IoT Analytics;", 5th International Conference on Internet of Things (IoT 2015), October 2015 Seoul, South Korea. Akhil Mathur, Marc Van den Broeck, Geert Vanderhulst, Afra Mashhadi and Fahim Kawsar "Quantified Workplace: Opportunities and Challenges". In Physical Analytics Workshop @ The Thirteenth International Conference on Mobile Systems, Applications, and Services (MobiSys 2015), Florence, Italy, May 20-22, 2015. Afra Mashhadi, Geert Vanderhulst, Utku Acer, and Fahim Kawsar "An Autonomous Reputation Framework for Physical Locations based on WiFi Signals". In Physical Analytics Workshop @ The Thirteenth International Conference on Mobile Systems, Applications, and Services (MobiSys 2015), Florence, Italy, May 20-22, 2015. Geert Vanderhulst, Mina Dashti, Afra Mashhadi and Fahim Kawsar "CrumblR: Enabling Proxemic Services through Opportunistic Location Sharing;". Work-In-Progress, 2015 International Conference on Pervasive Computing and Communication (PerCom 2015), Missouri, USA, March 23-27, 2015. Afra Mashhadi, Akhil Mathur and Fahim Kawsar "The Myth of Subtle Notifications;". Poster Proceedings, The 2014 ACM International Joint Conference on Pervasive and Ubiquitous Computing (UbiComp 2014), September, 2014, Seattle, USA. Geert Vanderhulst, Marc Van den Broeck and Fahim Kawsar "Exploring the Design Space for Geo-Fenced Connected Devices and Services at Home;". UPSIDE Workshop @ The 2014 ACM International Joint Conference on Pervasive and Ubiquitous Computing (UbiComp 2014), September, 2014, Seattle, USA. Fahim Kawsar, and A. J. Brush. "Home Computing Unplugged: Why, Where and When People Use Different Connected Devices at Home;". The 2013 ACM International Joint Conference on Pervasive and Ubiquitous Computing (UbiComp 2013), September, 2013, Zurich, Switzerland. Dimitri Schuurman, Bastiaan Baccarne, Fahim Kawsar, Constantijn Seys, Carina Veeckman, Lieven De Marez, and Pieter Ballon. "Living Labs as Quasi-experiments: Results from the Flemish LeYLab;". The XXIV ISPIM Conference - Innovating in Global Markets: Challenges for Sustainable Growth. June, 2013 Helsinki, Finland. Alexander Kroner, Jens Haupert, Chris Speed, Fahim Kawsar Thomas Ploetz, and Daniel Schreiber "Digital Object Memories in the Internet of Things "; DoMe-IoT Workshop, in conjunction with UbiComp 2012, The 14th International Conference on Ubiquitous Computing (UbiComp 2012), September 5-8, 2012. Jong Hyuk Park, Isaac Woungang, Jianhua Ma, Fahim Kawsar "Ubiquitous computing for communications and broadcasting. "; International Journal of Communication Systems 25(6): 689-690, 2012. Ming Ki Chong, Fahim Kawsar and Hans Gellersen "Spatial Co-Location for Device Association : The Connected Object Way". In: NOMe-IoT 2011: International Workshop on Networking and Object Memories in the Internet of Things @ UbiComp 2011, 18 Sep 2011, Beijing, China. Johan Criel, Geert Vanderhulst Fahim Kawsar and Lieven Trappeniers "A Co-Creation Platform for Creative Engagement of End-Users in a Connected Object Space.". In: NOMe-IoT 2011: International Workshop on Networking and Object Memories in the Internet of Things @ UbiComp 2011, 18 Sep 2011, Beijing, China. Chi Harold Liu, Alexander Kroener, Chris Speed, Pan Hui, Fahim Kawsar Wenjie Wang, Dan Wang, Thomas Ploetz, Boris Brandherm, Michael Schneider, Jens Haupert, and Peter Stephan "Networking and Object Memories in the Internet of Things.". In: NOMe-IoT 2011: International Workshop on Networking and Object Memories in the Internet of Things @ UbiComp 2011, 18 Sep 2011, Beijing, China. Geert Vanderhulst Fahim Kawsar, Johan Criel and Lieven Trappeniers "Prototyping Smart Objects for the Mass.". 13th IEEE International Conference on High Performance Computing & Communication, HPCC 2011, Banff, Alberta, Canada, September 2-4, 2011. Johan Criel, Marjan Geerts, Laurence Claeys and Fahim Kawsar "Empowering Elderly End-Users for Ambient Programming: The Tangible Way "; The 6th International Conference on Grid and Pervasive Computing (GPC 2011), Oulu, Finland, May 11-13, 2011. Fahim Kawsar, Gerd Kortuem and Bashar Altakrouri "Supporting Interaction with the Internet of Things across Objects, Time and Space "; Internet of Things 2010 Conference (IoT-2010), Nov 29 - Dec 1, Tokyo, Japan. Gerd Kortuem and Fahim Kawsar " Market-based User Innovation for the Internet of Things "; Internet of Things 2010 Conference (IoT-2010) Nov 29 - Dec 1, Tokyo, Japan. Michael Schneider, Alexander Kroner, Peter Stephan, Fahim Kawsar Gerd Kortuem, and Thomas Ploetz " Digital Object Memories in the Internet of Things Workshop "; DoMe-IoT Workshop, in conjunction with UbiComp 2010, The 12th International Conference on Ubiquitous Computing (UbiComp 2010), September 26-29, 2010. Ming-Ki Chong and Fahim Kawsar " Improving paper books: searchable books "; PaperComp 2010: 1st International Workshop on Paper Computing, in conjunction with UbiComp 2010, The 12th International Conference on Ubiquitous Computing (UbiComp 2010), September 26-29, 2010. Fahim Kawsar, Enrico Rukzio, and Gerd Korutem; "An Explorative Comparison of Magic Lens and Personal Projection for Interacting with Smart Objects "; 12th International Conference on Human-Computer Interaction with Mobile Devices and Services (MobileHCI 2010), Lisboa, Portugal September 7th-10th, 2010. Fahim Kawsar, Gerd Kortuem, and Bashar Altakrouri, "Designing Pervasive Interactions for Ambient Guidance with Situated Flows "; Fourth International Workshop on Human Aspects in Ambient Intelligence, in collaboration with the 2010 IEEE/WIC/ACM International Conference on Web Intelligence and Intelligent Agent Technology (WI-IAT 2010), Toronto, Canada, August31- September 3, 2010. Bashar Al Takrouri, Fahim Kawsar, and Gerd Kortuem "Spin&Swing : Spatial Interaction with Orientation Aware Devices. "; Demo in the Eighth International Conference on Pervasive Computing (Pervasive 2010), Helsinki, Finland, 17 - 20 May 2010. Gerd Kortuem and Fahim Kawsar "User Innovation for the Internet of Things. "; In the workrshop on " What can the Internet of Things do for the citizen?" in conjuction with the Eighth International Conference on Pervasive Computing (Pervasive 2010), Helsinki, Finland, 17 - 20 May 2010. Gerd Kortuem, Fahim Kawsar, and Bashar Al Takrouri "Flow Driven Ambient Guidance. "; Eighth Annual IEEE International Conference on Pervasive Computing and Communications (PerCom 2010), Mannheim, Germany March 29 - April 2, 2010. Gerd Kortuem, Fahim Kawsar, Daniel Fitton, and Vasughi Sundramoorthy "Smart Objects as Building Blocks for the Internet of Things"; IEEE Internet Computing, Special Issue of Internet of Things, January/February 2010, pp: 30-37. DOI: 10.1109/MIC.2009.143. Fahim Kawsar, Kaori Fujinami, Jong Hyuk Park, and Tatsuo Nakajima "A Smart Object Centric Indoor Location Model for Future Ubiquitous and Grid Services"; Journal of Internet Technology, Vol. 11, No. 1, 2010. Daniel Fitton, Gerd Kortuem and Fahim Kawsar; "Exploring the Application of Smart Objects in the Workplace"; Demo session @ UbiComp2009, the 11th International Conference on Ubiquitous Computing (UbiComp 2009), Orlando, USA, September 30- October 03, 2009. Fahim Kawsar and Gerd Kortuem; "Designing Interactions for Smart Objects with Flows"; 3rd International Workshop on Design and Integration Principles for Smart Objects (DIPSO 2009), in conjunction with UbiComp2009, the 11th International Conference on Ubiquitous Computing (UbiComp 2009), Orlando, USA, September 30- October 03, 2009. Fahim Kawsar and Tatsuo Nakajima; "Design and Implementation of a Framework for Building Distributed Smart Object Systems"; Springer Journal of Super Computing. DOI:10.1007/s11227-009-0323-4. Fahim Kawsar, Kaori Fujinami, Tatsuo Nakajima, Jong Hyuk Park and Sang-Soo Yeo; "A Portable Toolkit for Supporting End-User Personalization and Control in Context-Aware Applications"; Springer Journal of Multimedia Tools and Application. DOI: 10.1007/s11042-009-0330-8. Daniel Fitton, Fahim Kawsar and Gerd Kortuem; "Exploring The Design of a Memory Model for Smart Objects"; 1st International Workshop on Digital Object Memories (DOMe 2009), In conjunction with The 5th International Conference on Intelligent Environment (IE09), Barcelona, Spain, July 2009. Fahim Kawsar and Tatsuo Nakajima; "A Document centric Framework for Building Distributed Smart Object Systems "; 12th IEEE International Symposium on Object/component/service-oriented Real-time distributed Computing (ISORC 2009) Tokyo, Japan, March 17-20, 2009. Fahim Kawsar "A Document based Framework for User Centric Smart Object Systems"; Ph.D. Dissertation, Department of Computer Science, Waseda University, Tokyo, Japan, February, 2009. Fahim Kawsar, Tatsuo Nakajima and Jong Hyuk Park; "A Document based Framework for Smart Object Systems"; The 2nd International Conference on Future Generation Communication and Networking. Horizon Resort, Sanya, Hainan Island, China, December 13-15, 2008. Fahim Kawsar, Fernando Lyardet and Tatsuo Nakajima; "Three Challenges for Future Smart Object Systems"; 2nd International Workshop on Smart Products: Building Blocks of Ambient Intelligence (AmI-Block'08), The 2008 European Conference of Ambient Intelligence, Nurnberg, Germany. November 19-22, 2008. Fahim Kawsar, Mostafa Al Masum Shaikh, Jong Hyuk Park, Mitsuru Ishizuka and Tatsuo Nakajima; "Augmenting User Interaction in a Smart Home Applying Commonsense Knowledge"; International Journal of Smart Home, Vol. 2, No. 4, October, 2008. Sheikh I. Ahamed, Farzana Rahman, Endadul Hoque, Fahim Kawsar, Tatsuo Nakajima; "Secure and Efficient Tag Searching in RFID Systems using Serverless Search Protocol"; International Journal of Security and Its Applications, Vol.3, No.4, October 2008. Fahim Kawsar, Kaori Fujinami, and Tatsuo Nakajima; "Deploy Spontaneously: Supporting End-Users in Building and Enhancing a Smart Home"; The Tenth International Conference on Ubiquitous Computing (Ubicomp 2008), Seoul, South Korea, September 21 - 24, 2008. Fahim Kawsar, Michael Beigl, Kaori Fujinami, Gregor Schiele, Tsutomu Terada, Susanna Pirttikangas, Jin Nakazawa "Design and Integration Principles for Smart Objects" ; Workshop Overview Paper, 2nd International Workshop on Design and Integration Principles for Smart Objects (DIPSO 2008), in conjunction with UbiComp2008, the 10th International Conference on Ubiquitous Computing (UbiComp 2008), Seoul,Korea September 21-24, 2008. Fahim Kawsar, and Tatsuo Nakajima; "End User Tool for Deploying Smart Object Systems"; Demo Session, The Fifth Annual International Conference on Mobile and Ubiquitous Systems: Computing, Networking and Services (MobiQuitous 2008), Dublin, Ireland, July 21-25, 2008. Fahim Kawsar, Kaori Fujinami, and Tatsuo Nakajima; "A Document Centric Approach for Supporting Incremental Deployment of Pervasive Applications"; The Fifth Annual International Conference on Mobile and Ubiquitous Systems: Computing, Networking and Services (MobiQuitous 2008), Dublin, Ireland, July 21-25, 2008. Fahim Kawsar, Kaori Fujinami and Tatsuo Nakajima; "Prottoy Middleware Platform for Smart Object Systems"; Special Issue on New Advances and Challenges in Smart Home, International Journal of Smart Home, Vol. 2, No. 3, July, 2008. Fahim Kawsar, Mostafa Al Masum Shaikh, Tatsuo Nakajima and Sheikh I. Ahamed; "Applying Commonsense to Augment User Interaction in an Intelligent Environment"; The 4th IET International Conference on Intelligent Environment (IE08), Seattle, USA, July 2008. Sheikh I. Ahamed, Farzana Rahman, Endadul Hoque, Fahim Kawsar, Tatsuo Nakajima; "YA-SRAP: Yet Another Serverless RFID Authentication Protocol"; The 4th IET International Conference on Intelligent Environment (IE08), Seattle, USA, July 2008. Fahim Kawsar , Mostafa Al Masum Shaikh and Ishizuka Mitsuru; "Text Beautifier: An Affective-Text Tool to Tailor Written Text"; In Extended Abstarct Proceedings of the Twenty-Third AAAI Conference on Artificial Intelligence	(AAAI 08),Chicago, Illinois, USA, July 2008. Kaori Fujinami and Fahim Kawsar; "An Experience with Augmenting a Mirror as a Personal Ambient Display"; In Proceedings of the 8th Asia-Pacific Conference on Computer Human Interaction (APCHI2008), Seoul, Korea, July 2008. Sheikh I. Ahamed, Farzana Rahman, Endadul Hoque, Fahim Kawsar, Tatsuo Nakajima; "S3PR: Secure Serverless Search Protocols for RFID"; In the Proceedings of Second IEEE International Conference on Information Security and Assurance (ISA 2008), April 24-26, 2008, Busan, Korea. Fahim Kawsar, Tatsuo Nakajima; "Persona: A Portable Tool for Augmenting Proactive Applications with Multi-modal Personalization Support"; In the Proceedings of The 6th International Conference on Mobile and Ubiquitous Multimedia (MUM 2007), Oulu, Finland, December 12-14, 2007. Fahim Kawsar, Kaori Fujinami, Tatsuo Nakajima; "Approaching Intelligent Environment through Sentient Artefacts"; In the Proceedings of The 10th International Conference on Computer and Information Technology (ICCIT 2007), Dhaka, Bangladesh, December 2007. Simo Hosio, Fahim Kawsar, Jukka Riekki, Tatsuo Nakajima; "DroPicks: A Tool for Collaborative Content Sharing Exploiting Everyday Artefacts "; The Fouth International Symposium on Ubiquitous Computing Systems (UCS 2007) Akihabara, Tokyo, Japan, November 26-28, 2007. Teruhide Kusaka, Kimura Hiroaki, Fahim Kawsar, Tatsuo Nakajima; "A Visually Attractive Interaction Device Suitable for Living Spaces" ; Poster Proceedings of The 20th ACM Symposium on User Interface Software and Technology, UIST 2007, Newport, RI, USA, October 7-10, 2007. Fahim Kawsar, Kaori Fujinami, Tatsuo Nakajima; "Experiences with Building Intelligent Environment through Sentient Artefacts" ; The 3rd IET International Conference on Intelligent Environment (IE07), Ulm, Germany, September 24-26, 2007. Fahim Kawsar, Tsutomu Terada,Gerd Kortuem,Kaori Fujinami, Susanna Pirttikangas, Jin Nakazawa "Design and Integration Principles for Smart Objects"; Workshop Overview Paper, 1st International Workshop on Design and Integration Principles for Smart Objects (DIPSO 2007), in conjunction with UbiComp2007, the 9th International Conference on Ubiquitous Computing (UbiComp 2007), Innsbruck Austria, September 16-19, 2007. Fahim Kawsar, Tatsuo Nakajima; "Bringing Augmented Artefacts out of the Laboratory" 1st International Workshop on Design and Integration Principles for Smart Objects (DIPSO 2007), The 9th International Conference on Ubiquitous Computing (UbiComp 2007), Innsbruck Austria, September 16-19, 2007. Simo Hosio, Fahim Kawsar, Jukka Riekki, Tatsuo Nakajima; "Utilizing Everyday Artefacts for Content Sharing" Adj. Proceedings of the 9th International Conference on Ubiquitous Computing (UbiComp 2007), Innsbruck Austria, September 16-19, 2007. Fahim Kawsar, Kaori Fujinami, Susanna Pirttikangas, Keisuke Hayashi, Tatsuo Nakajima; "RoonRoon: A Wearable Teddy as Social Interface for Contextual Notification" ; The International Conference and Exhibition on Next Generation Mobile Applications, Services and Technolgies, Cardiff, Wales,UK. September 12-14, 2007. Fahim Kawsar, Kaori Fujinami, Tatsuo Nakajima; "A Lightweight Indoor Location Model for Sentient Artefacts using Sentient Artefacts"; The 22nd Annual ACM Symposium on Applied Computing (SIGAPP), Seoul, Korea, March 11 - 15, 2007. Fahim Kawsar, Kaori Fujinami, Tatsuo Nakajima; "Exploiting Passive Advantages of Sentient Artefacts" 2006 International Symposium on Ubiquitous Computing Systems (UCS 2006) COEX, Seoul, Korea October 11-13, 2006. Fahim Kawsar, Kaori Fujinami, Susanna Pirttikangas, Tatsuo Nakajima; "Personalization and Context Aware Services: A Middleware Perspective"; In the Proceedings of The 2nd International Workshop on Personalized Context Modeling and Management for UbiComp Applications, A Workshop in conjunction with UbiComp2005, the 8th International Conference on Ubiquitous Computing (UbiComp 2006), Orange County, USA, September 2006. Fahim Kawsar, Kaori Fujinami,Tatsuo Nakajima; "What Makes a Good Pervasive Middleware?" Adj. Proceedings of the 8th International Conference on Ubiquitous Computing (UbiComp 2006), Orange County, USA, September 2006. Fahim Kawsar, Kaori Fujinami, Tatsuo Nakajima; "A Lightweight Location System for Sentient Artefacts"; System for Programming and Applications 2006, Shiobara, Japan, March 2006. Fahim Kawsar, Kaori Fujinami, Tatsuo Nakajima; "Prottoy: A Middleware for Sentient Environment"; Proceeding of the Embedded and Ubiquitous Computing: International Conference EUC 2005, Nagasaki, Japan, December 6-9, 2005. Lecture Notes in Computer Science (LNCS) Volume 3824 / 2005 pp. 1165-1176. Fahim Kawsar , Kaori Fujinami, Tatsuo Nakajima; "Augmenting Everyday Life with Sentient Artefacts" ; Proceedings of the 2005 joint conference on Smart objects and ambient intelligence: innovative context-aware services: usages and technologies sOc-EUSAI '05, Grenoble, France, October 2005, ACM Press, pp: 141-146. Fahim Kawsar, Kaori Fujinami, Tatsuo Nakajima; "Experiences with Developing Context-Aware Applications with Augmented Artefacts"; In the Proceedings of The 1st International Workshop on Personalized Context Modeling and Management for UbiComp Applications, A Workshop in conjunction with UbiComp2005, the 7th International Conference on Ubiquitous Computing (UbiComp 2005). Tokyo, Japan, September 2005. pp: 111-120. Kaori Fujinami, Kanako Okada, Fahim Kawsar, Tatsuo Nakajima; "Living with Sentient Artefacts" Video Proceedings of the 7th International Conference on Ubiquitous Computing (UbiComp 2005), Tokyo, Japan, September, 2005. Fahim Kawsar, Kaori Fujinami, Tatsuo Nakajima; "Design and Implementation of a Software Infrastructure for Integrating Sentient Artefact"; Proceedings of the Second Annual International Conference on Mobile and Ubiquitous Systems: Networking and Services - MobiQuitous '05, San Diego, USA, July 2005, IEEE Computer Society, pp: 510-512. Kaori Fujinami, Fahim Kawsar, Tatsuo Nakajima; "AwareMirror: A Personalized Display using a Mirror"; Proceedings of The 3rd International Conference on Pervasive Computing (Pervasive2005), Munich, Germany, May 2005. Lecture Notes in Computer Science (LNCS) Volume 346 / 2005, pp. 315-332. Fahim Kawsar, Kaori Fujinami, Tatsuo Nakajima; “Prottoy: A Context Aware Application Framework". In the Poster Proceedings of the 2nd International Symposium on Ubiquitous Computing Systems, UCS 2004, Tokyo, Japan, November 2004. Fahim Kawsar, Shahriar Saikat, Shariful Hasan, Abdur Razzaque, M A Mottalib; "An Efficient Token Based Algorithm in Distributed System for Mutual Exclusion"; Journal of Engineering and Technology, Vol. 2 No.2, pp.39-44 July-December 2003. Fahim Kawsar, Shahriar Saikat, Shariful Hasan; "IUT Job Cracker: Design and Implementation of a Dynamic Job Scheduler for Distributed Computation"; In the Proceedings of The 6th International Conference on Computer and Information Technology (ICCIT 2003), Dhaka, Bangladesh, December 2003. Shariful Hasan, Fahim Kawsar, Shahriar Saikat; "Bengali Digit Recognition System using 3 - layer Back propagation Neural Network"; In the Proceedings of The 6th International Conference on Computer and Information Technology (ICCIT 2003), pp. 327-331, Dhaka, Bangladesh, December 2003. Asif Ahmed Anik and Fahim Kawsar; "An Optimal Dependable Computing Grid for Ubiquitous Computing Infrastructure" In the Proceedings of The 6th International Conference on Computer and Information Technology (ICCIT 2003), pp. 487-491, Dhaka, Bangladesh, December 2003. Shariful Hasan, Fahim Kawsar, Shahriar Shaikat; "Transparent Process Migration in Integrated Distributed Computing Environment (IDCE)"; In the Proceedings of The 6th International Conference on Computer and Information Technology (ICCIT 2003), pp. 496-500, Dhaka, Bangladesh, December 2003. Fahim Kawsar, Shahriar Saikat, Shariful Hasan, Abdur Razzaque, M A Mottalib; "An Efficient Dynamic Scheduling Algorithm in Distributed System, In the Proceedings of The 5th International Conference on Computer and Information Technology (ICCIT 2002), pp. 93-97, Dhaka, Bangladesh, December 2002. Fahim Kawsar, Shahriar Saikat, Shariful Hasan, Abdur Razzaque, M A Mottalib; "An Efficient Token Based Algorithm in Distributed System for Mutual Exclusion"; In the Proceedings of The 5th International Conference on Computer and Information Technology (ICCIT 2002), pp. 97-100, Dhaka, Bangladesh, December, 2002.